Check us out this coming Monday in Old Town Sac for Americana weekend. We look forward to participating via the California Auto Museum. Americana Style, this is going to be a day of eye candy! Special announcement: Plans for the next car show and pageant are to participate in BillitProof in Antioch at the end of September. I receive through the grapevine critical feedback regarding the recent onslaught of couple posts and images we produce. The notion to incorporate a man into my photos was hatched while speaking with a friend who happens to be a multi-award-winning car owner. A few weeks before Midnight Mass, we are chatting about show prep and he shares with me some stories about having his car photographed then inquires more about what it is like for the model and photographer. Consorting and exploring the experiences flows into an agreement to produce a shoot then I suggested we invite him to actually take a picture with his own car, why not? That night, I sleep on the notion and come up with three story lines to attempt to photograph, because Pinup and other photography is meant to tell a story. What story do we want to tell? You will find out, as our schedules permit this coming weekend as the day, six weeks out from the original plan. Keep your eyes peeled for Matt Martin and his handy work! Plans with Matt fresh on my brain, Shane and I set out to Blues dance for the first time at the Firehouse 5 on the Sunday before Mass. Last dance of the night, and I spy a mysteriously dark and handsome gentleman keeping to himself in the corner. Why not? I ask for a dance and comment on his “Rockabilly” or Greaser style then during small talk plan to ask if he will attend Mass, but he beats me to it! Seven years in a row has he attended. I’m excited to continue the conversation, alas the last song of the night is constant partner switch. We gratefully land one another to finish the song. He delivers the information that he as well is a pinup model. I am floored and after the dance, I introduce Gravy to Shane and we enamor over the pictures he shows on his phone. We exchange information, and plan to meet up at Midnight Mass. You’ve all seen the images of our first shoot with Out-Law Photography. Brilliant. We meet up, enjoy the twenty minute shoot, and chat afterward. We like the images and experience so much, we make plans for another shoot and two weeks later we produce Cabaret, out of which I consider to pull out three good images as lucky. We pull twenty-six. I like the way we work together. We plan another shoot at the beach, and get yet another land fall ensues. What’s going on? We enjoy photo shoots and have fantastic chemistry. We look good together and flow together naturally. I like the images we produce. Shane hesitates that what we are putting out is not “Pinup”. What is Pinup? An image informally hung that somebody wants to look at. We are not married to a set ideal of Pinup nor to producing a confined box of images that have to be a certain way. I enjoy vintage-inspired fashion. Shane enjoys taking pictures. This blog is named The Pinup Pursuit not because I plan to achieve perfect Pinup images, whatever that looks like, but because we are on a journey. We explore my adoration of vintage fashion, Shane’s photography fetish, and how all can play out in community. This is a pursuit as in we may never reach a set destination. Exploration always, and anyone interested is welcome to enjoy our pursuit of images you’d want to pin on the wall. Check us out this coming Monday in Old Town Sac for Americana weekend. We look forward to participating via the California Auto Museum. American Style, this is going to be a day of eye candy! More Midnight Mass Out-Law Photography! Jason with Out-Law Photography has sent over more shots from Midnight Mass! Gravy and I were pretty excited to see these. I love them! What do you think? Previous Midnight Mass images from Out-Law Photography. Here is my event pre-shoot. We headed down the coast Saturday to capture images of some authentic vintage swimwear. Gravy and I are both wearing bathing suits I picked up on OLL. A lovely day and picnic at the beach it was, even though the sun was shining only a short while. We took 2500 photos, so I will be an occupied lady this week sorting and narrowing down the collection to presentable size. Here is an overview of our fun frolicking in the sand, can you hear the ocean waves rolling in and out? 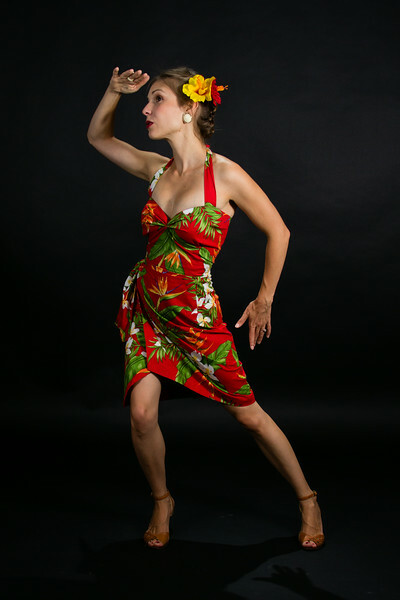 Most pinup girls own or want to own a sarong dress. Options are to purchase a mass produced reproduction, find authentic vintage, or have one made. I chose to have one made by the affordable Tatted Tina Lopez. The two back darts needed to be taken out and I sewed new darts to hug my back curve, but such is life when ordering a tight fitting garment from all the way across the country! Pictured are Gigi’s Hawaiian necklace, broach at the tie, earrings, and ring. On my feet are Brazilian made shoes picked up from Racks Boutique. I had the time of my life dancing in this dress a few weeks ago, but then again every night I get to go dancing is the time of my life just about anymore. I LOVE Big Band and Blues music, amplified when twirling about the floor with the fun leads of Sacramento. I’m really taking a gamble on the light application of Bare Minerals face makeup in these photos and hope you are viewing this on a little phone screen to just see the outline and not details of these images. I do not wear heavy makeup as is common for photo shoots when I dance. This is the result when photos are snapped on the way out for a night of dancing!